Producer, Rushi Munshi has a background in Bollywood films as an Assistant Director. Additionally, Rushi, has experience as a Writer and Director of both TV and Theatre productions in Mumbai, India. Subsequently, he has worked for a range of local authorities in the field of arts and has initiated and managed large scale festivals, residencies, touring performances, arts grants and community arts activities. From being a Principal Arts Officer at Rotherham MBC, he took a leap and became a Regional Director for a national charity. 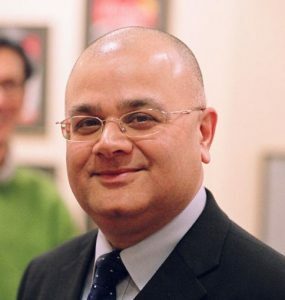 Subsequently, Rushi managed East Midlands, Yorkshire & Humber and North West regions, working with charity organisations as well as statutory agencies. Since late 2011, he is working as a freelance business consultant across the North of England. Four of his bespoke training programmes have been recognised by the Institute of Leadership & Management. Rushi, also, gets commissioned to develop bespoke training programmes and obtain accreditation from the appropriate institutions. His bespoke Employability and Entrepreneurship training programmes have remained highly successful. Currently, Rushi works for three organisations on a regular basis. plus other short term freelance contracts. Rushi Munshi is, also, the Business Manager for Ri Ri’s Dance Academy Ltd.